Kathleen Wynne speaks at the BomberShelter Pub in Waterloo. Photo by Meehakk Mulani. Wynne spoke at the University of Waterloo on May 3 at the AHS building. She was accompanied by Kathryn McGarry and Daiene Vernile. 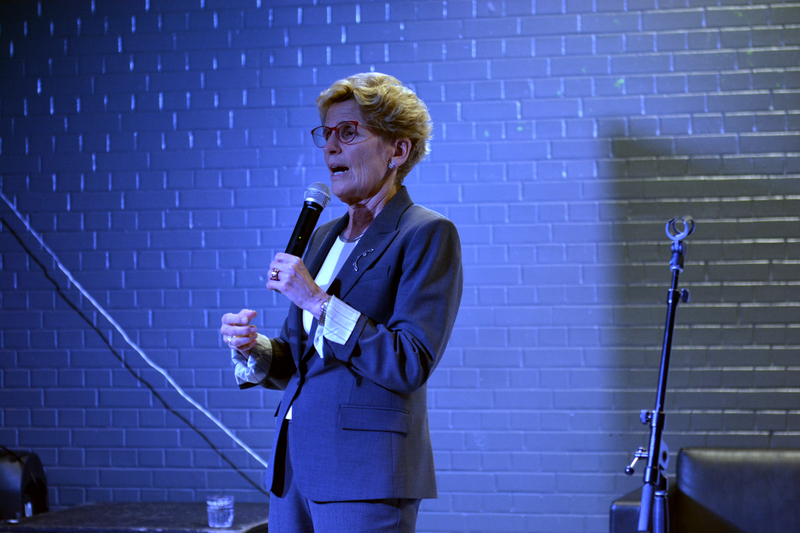 Wynne discussed the uncertainty of the future. The prescription pills being made accessible to young people include, but are not limited to medication for mental health and birth control. “It was very critical to us to have the coverage go far enough into the young adult’s life that they would get the coverage they need. We know that the best thing would be to have a national Pharmacare plan that would cover everyone his is a big step in that direction” said Wynne. “Basic income is something that has been talked about for 35 years and it is something that I think we need to gather evidence, and see if there is a better way supporting people who are not able to take part in the economy to help them to get there – that is basically what the basic income pilot is about” explained Wynne, regarding the pilot project. Wynne made clear that the program is universal and that “no matter what your income in this province you have access to a great healthcare system,” in response to why Pharmacare is open to all income earners. The 42nd provincial elections is set to take place on June 7, 2018; Wynne is running for re-election. Bill 26 would require all employers to provide their employees with adequate training and information on domestic and sexual violence in the workplace. “This would ensure all staff and faculty on campus with student-facing roles are trained on prevention in UW’s policy 42, which is the sexual violence prevention policy. Which also has listed the protocols and pathways of reporting and disclosing sexual violence” said Brieva.